How much do union members earn in France? 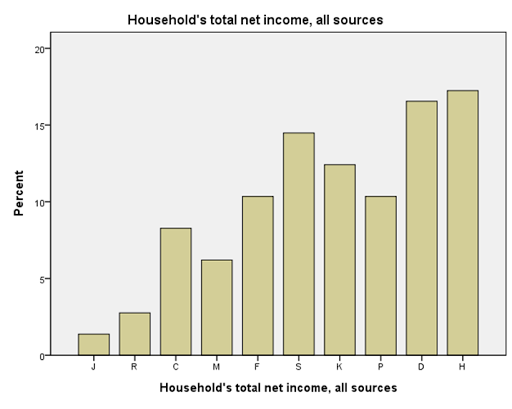 Below a sample of the distribution of union members household’s income deciles, as was reported in the European Social Survey 2008 (http://ess.nsd.uib.no/ess/round4/download.html). In a nuthshell: about 30% of unions members have a Household’s total net income superior to 3301€ per month, among which about 15% earn more than 4101€ per month. Those who earn less than 1,200 € per month represent less than 10% of total union members. The way I arrived at this figure is by filtering the French ESS data and restricting to those who are current union members and then computing the distribution fo income deciles responses for that sub-samples. And the winner is… the UK!